New Years is almost here! Yay! 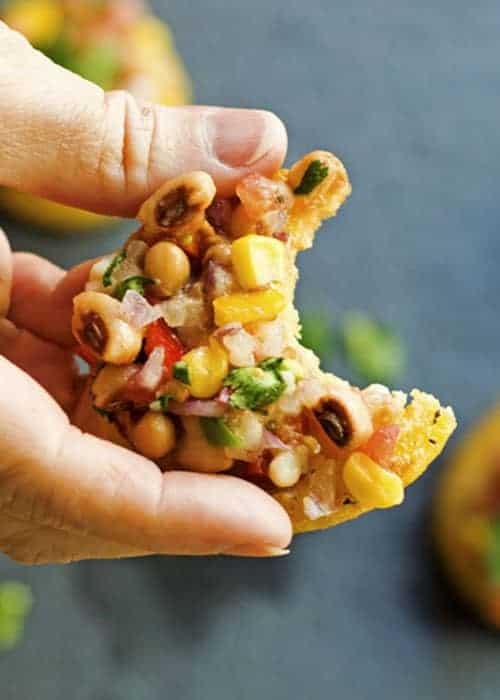 This Black Eyed Pea Salsa with Crispy Polenta is a great way to bring in the New Year. It has your black eyed peas for luck. It’s vegan, and it’s healthy (but tastes not healthy). Yum. The polenta makes this dish! It’s crispy on the outside, and creamy in the middle. All this chopping is worth it I promise. 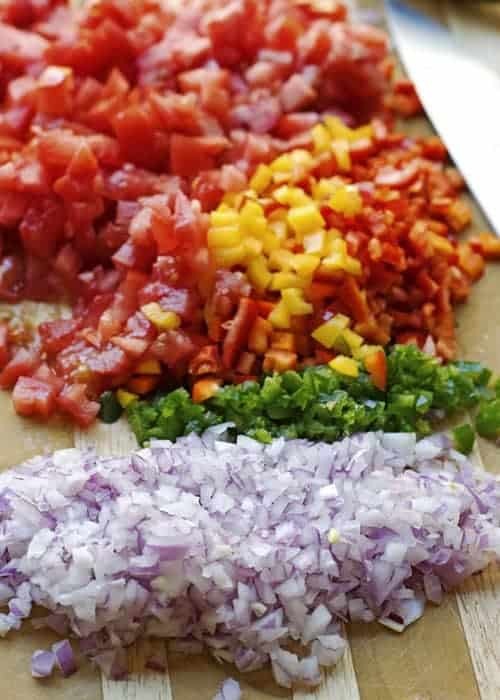 I put tomatoes, cilantro, onion, jalapenos, and bell pepper in my salsa. 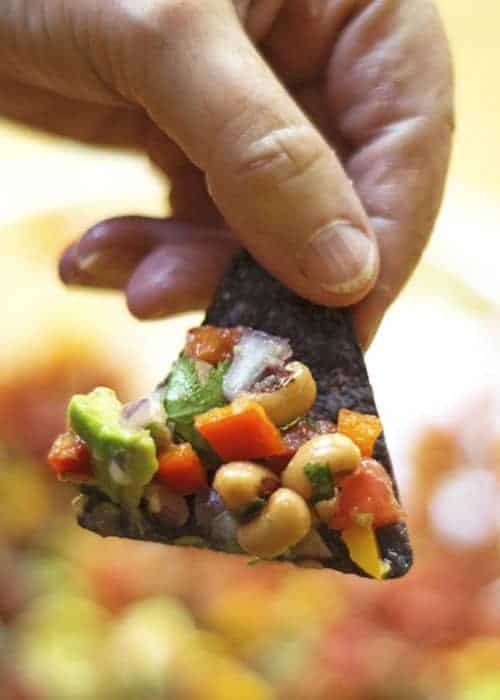 Then dump in some thawed corn kernels for sweetness, some black eyed peas for heartiness, and some avocado for creaminess. I love all the colors. They make me smile. 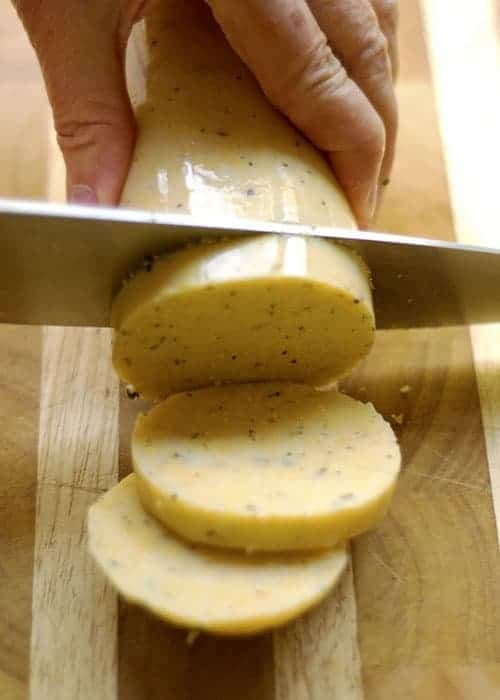 The dressing is just lime juice, salt, and pepper. So simple and clean. I love it. Now it’s polenta time… Start by slicing a tube of polenta into 1/4″ slices. Be patient, this does take a little while. It took my batch about 7- 10 minutes on each side. Again it is sooooo worth it. I love polenta. I think I just love corn. I am seeing a pattern…Tortilla chips, polenta, grits….yeah anything with corn. We should probably test the salsa while we are waiting for the polenta… Yep…a dash more salt. Maybe one more chip. 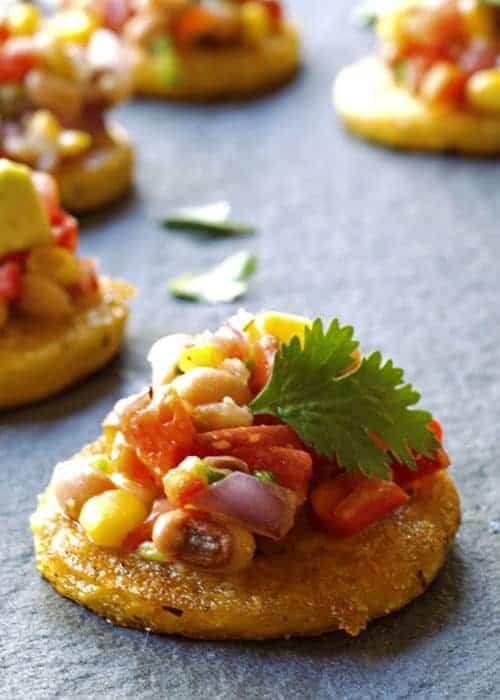 Black Eyed Pea Salsa with Crispy Polenta is a great vegan appetizer for any special occasion. I love it for New Year’s Eve appetizer since black eyed peas are good luck. The crispy polenta adds some elegance to this salsa. Chop all of the vegetables (onion, cilantro, bell pepper, jalapeños, and tomatoes), and toss them in a large mixing bowl. 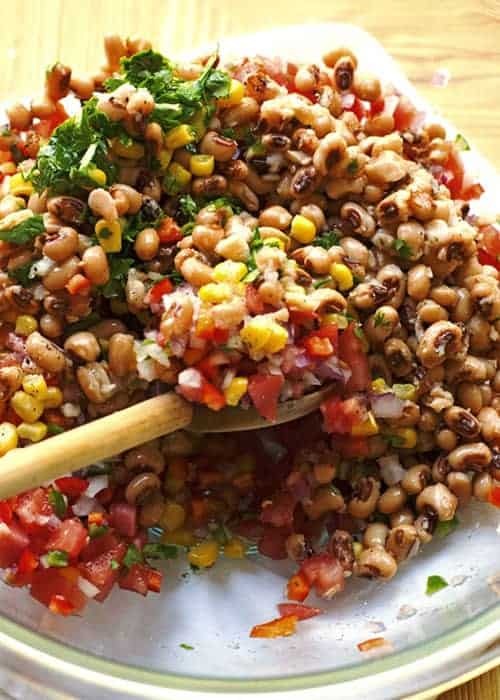 Dump in the corn kernels, grated garlic, and black eyed peas. Mix together. Add the seasoning (salt, pepper, and lime) and the diced avocado. Mix everything together. Heat a large skillet over medium high heat. Add 2 Tablespoons of olive oil to the pan. 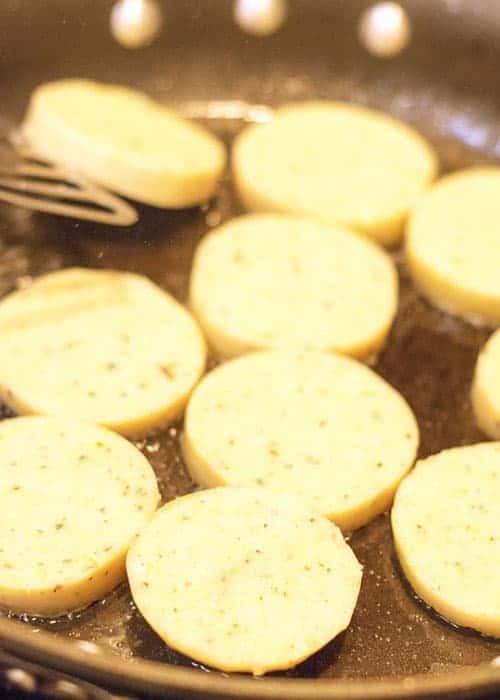 Carefully lay the polenta slices in an even layer into the hot skillet. THE POLENTA WILL POP AND SPLATTER. BE CAREFUL! Brown the polenta on one side for about 7-10 minutes. Flip and brown the other side for about 7-10 more minutes. Once the polenta is done place the rounds on a paper towel to absorb the excess oil. 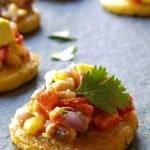 Top each polenta round with the black eyed pea salsa! Wow, this looks delish. And it’s so colorful and pretty, too! Need to try this soon!